We don’t get abroad on holiday every year. 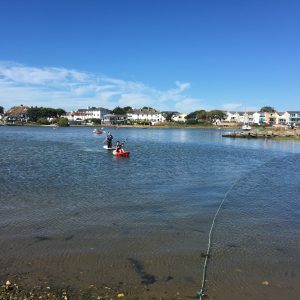 When my mum lived in Bournemouth we would just rock up there for a few weeks every summer, and since she died we now have our lovely holiday home in Mudeford. It’s not quite the same as visiting Grandma, but it’s a lovely place to get some sun and sea. But last year, I felt we were in need of a bit of sun, and a proper summer holiday experience after the disaster that was 2015. 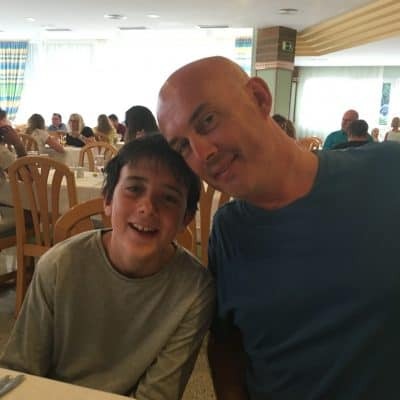 So we took our kids off to Fuerteventura for 2 weeks, which was our first time abroad since 2012. And during those 4 years quite a lot has changed. Travelling with a 13 and 11 year old is a completely different ball game to travelling with a 9 and 7 year old. Some of my travel must haves have changed completely, but surprisingly, others not so much. 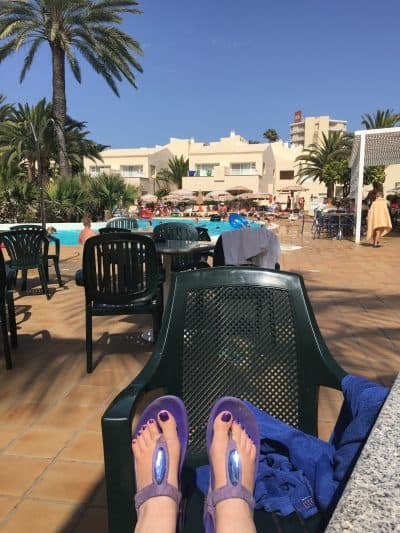 So when Mark Warner said they wanted bloggers to write about their 10 travel must haves to enter their Blog Ambassador Programme this year, I thought I would tell you a bit about what has changed. Sometimes the children change so fast that you can’t keep up with them, and sometimes you think they have changed but they haven’t really. Some of the items are things to travel with and some are things to buy (or experience) when you are there. 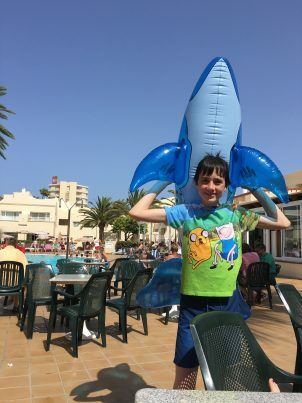 Thankfully now the children pretty much pack for, and dress and look after themselves, so I don’t have to take so much essential kit for them, and I get a lot more me time and space in my suitcase than I am used to on holiday. It’s bliss. You can like them or hate them at home, but take a teenager on a long journey or to another country without their gadget of choice, and you are just asking for whiny, whingy trouble. Whether your teen is the type who wants to take selfies at every new place, whether they play games all the time (my son), or whether they want to use the Wifi zones to FaceTime with their friends (my daughter), they will be a lot calmer and happier if they are connected every so often. This is a holiday though, and I for one will not permit them to spend the entire time on gadgets. I chose not to give them mobile data on their phones, so they had to make do with Wifi. 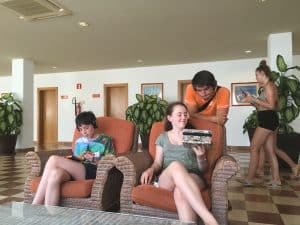 Then we chose not to have Wifi in our rooms at our resort – the children had to pay for it every couple of days for an hour or so, and sit in the hotel lobby. That was a great bargaining tool for us – it limited their screen time so they had to spend more time outdoors, and it also meant we could hook them up for their allotted hour or so and nip off for some parents only time…..
I’m not complaining completely about gadgets though – I loaded lots of audiobooks from Audible and real books from Kindle onto my iPad, plus the Calm app, and I really enjoyed, reading, listening and meditating while the children splashed around in the pool. That wouldn’t have happened 4 years ago for sure! 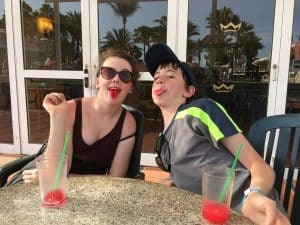 My children are totally not used to hot climates. My son in particular would happily wear long trousers and sweatshirts most of the year in the UK. I had to invest in quite a few different clothes for him, and also persuade my daughter to buy some dresses, otherwise we would have fried. I will freely admit though, I do miss the cute little floppy sunhats that they used to wear when they were little. As a mum of teenagers, sadly you can’t control what they wear to the same extent…. Sandals by FitFlop and matching gel pedi – well you kind of have to , don’t you…? This bit doesn’t change at all. No matter how old they get or how much they wriggle away from you, it is still your absolute duty as a mum to slather as much goop on them as you can throughout the holidays. 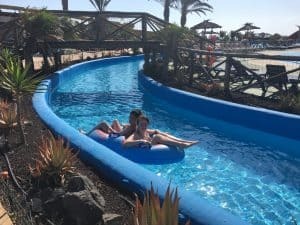 I prefer a spray because it’s so much easier, and we have moved down from factor 50 to factor 30 so we all get a bit of a tan and some Vitamin D, but we certainly got through a good few pots of suncream and lip balm in Fuerteventura. When I’m on holiday I have lots of things to carry about from day to day. Whether it’s the passports, tickets and all the travelling stuff, or whether it’s suncream, local currency a guidebook, or just a book to read by the side of the pool, I’m always heavy laden. So my normal handbag just won’t cut it abroad, and I like to have something a bit more cavernous. If it can be fun and funky then so much the better. 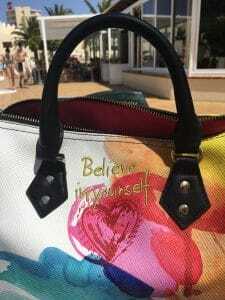 I picked up this little beauty while we were on holiday last year in the Desigual shop at our resort. It’s bright, funky, fun and just the right size – I love the uplifting messages on it. Not only that but it was less than half the price it would have been at home, so it was a complete bargain. 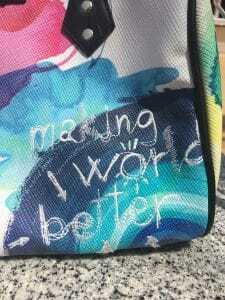 This is the sort of bag that adds a smile to every day for me, and the sort of retail therapy shopping trip which is a hallmark of any good holiday. The time was, when we wouldn’t travel anywhere without something for the kids to play with, and every trip also necessitated a visit to the local toy shop to see what was there, that they couldn’t get at home. A trip to the seaside wasn’t complete without a bucket and spade, and maybe some kind of inflatable for the pool or the sea (with supervision of course). 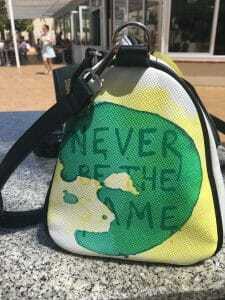 I honestly thought those times had gone, and so we travelled to Fuerteventura without any of that stuff. And then they saw the inflatable dolphin…. He was christened Whoops! because it was just so hard to stay on top of him, and once he came to live in our apartment, the children regressed by at least five years. All trace of sophistication vanished and they were back to being little kids again, splashing about in the water like toddlers. Pure holiday magic – every teen family should have one! This may not be for everybody’s children but with mine, when we go away we need to find the water. 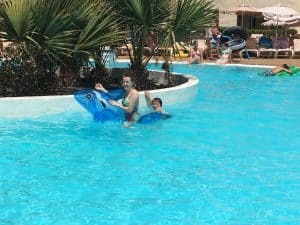 Once they have tried the local pool we need to go in the sea, and then we need to find the waterpark and local watersports centre. Sometimes at home they can barely stand to share the same house, but give them an inflatable for two, and a lazy river and they will keep each other company for hours. 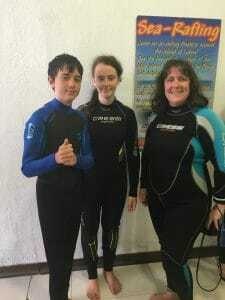 I can’t wait to take them sailing, windsurfing and/or waterskiing. These are definitely on the bucket list in the next few years….. When they were little, the first thing we would have to do is take them to the zoo. Now (thankfully) it’s enough for them to see some local animals in their natural habitat. 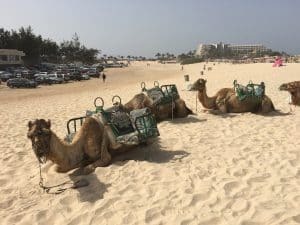 They loved the camels, although we never did get to ride them as they were always booked up. As to this fella – I have no idea what he is, but he came to see us regularly. When we went away before, the children were still young enough, that evening entertainment meant going back to our flat and having an early night. Now they want to be up and about all night and join in the nightlife as well as the day life. My daughter in particular had great fun singing karaoke (but she asked me very kindly not to put up the video I was just about to post, so in deference to her I have omitted it). Some days the heat just got too much, and so the family retreated to our apartment and we had a couple of family games nights. 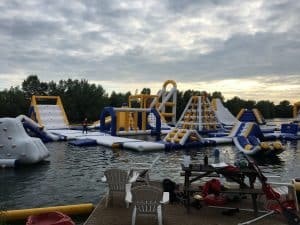 These can get quite wild and raucous with us, and definitely helped in the pursuit of family fun. If you like to travel light, I recommend taking card games, although as we are such a nerdy family, we usually travel with a few boardgames as well. The children’s favourite card game bar none is Munchkin. We have several add ons for this crazy anarchic game. We always end up shouting a lot and the game goes on for hours, but it is all in good fun. Another recent favourite is a very simple game called Love Letters. This is much simpler and a much shorter game but the bluff and double bluff involved in winning is very clever indeed. So there you have it – everything you need to travel successfully with the modern teenager. 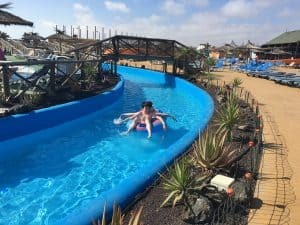 Add in a serious dose of good humour, and a lot of patience (especially if you need them to get out of bed, dress or move anywhere) and you have the recipe for one amazing family holiday. Don’t forget to feed them regularly and keep slapping on the sunscreen! What do your teenagers like to take, wear, eat or do on holiday? And what are your travel must haves? Please leave a comment and let me know. I love Munchkin! We used to have a whole cupboard full. Haven’t played it since before children, alas! My children really love the Adventure time extension , and Cheat with both Hands. Great tips. Especially the no WiFi ones. 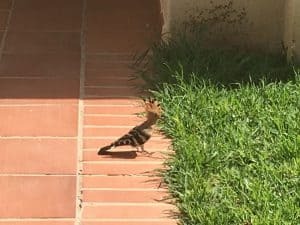 That bird looks like a hoopoe. Used to see them all the time in Majorca. Thanks, that answered my question. I’m pretty useless with unusual birds…. We have always played games as a family, from Snakes and Ladders up to really complicated stuff now. Some great tips for ensuring you have a good holiday. We are yet to venture abroad with our three children. Comfy clothes and shoes are a must for me on holiday!